Cost-effective 12-Channel High Power DMX Decoder driver 12-24V With RJ45 interface 5A (Each CH), total 60A Compatible with many RGB/RGBW or white LED. 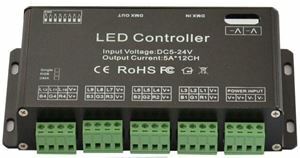 Cost-effective 12-Channel High Power DMX Decoder driver. Comes with high quality, removable phoenix connectors for wire connection. Compatible with many RGB, RGBW or white LED. Good for 12 sections of white LED, 4 sections of RGB LED or 3 sections or RGBW LED. This a recommended DMX decoder to work with the Domaudeo RGB LED Lightning Control Solution using our Advanced DMX Driver for Control4. If provided smooth fades and no flickering. With a cost per channel half of the PX24500, this affordable decoder can be use as a single driver for up to 12 sections of light. 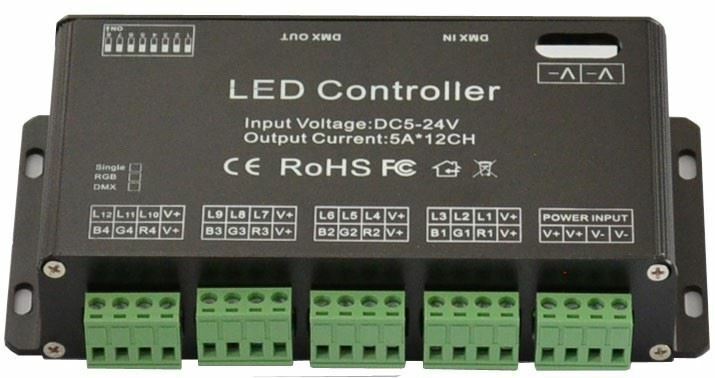 This decoder is available in many flavor everywhere on the Internet, but when buying from Houselogix, you can get a complete, tested and garanteed DMX lightning solution for Control4, everything at the same store.